On opening weekend for the 2018 Sturgis Motorcycle Rally, Renewable Fuels Association‘s Robert White took the stage to welcome other sponsors and talk about the big annual Legends Ride today. Pictured here are some of the RFA members on the scene this week to help with Free Fuel Happy Hours which begin tomorrow afternoon (free E10 fuel for motorcycles). 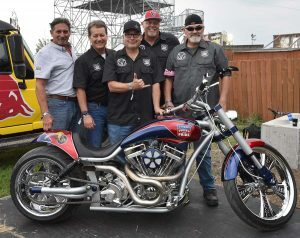 Robert will be in the lead of the Legends Ride on the motorcycle built by Paul Teutul, Jr. Participants have to be registered and the event attracts lots of big names in the biking world as well as celebrities. Paul also built a custom motorcycle for The Buffalo Chip Campground which will be auctioned off right before the start of today’s ride.